Practitioners believe that when the finger representing a particular element is brought into contact with the thumb, that element is brought into balance, creating a stabilizing effect on the entire body. Mudras are believed to start electromagnetic currents within the body, create balance and promote health. People practice mudra virtually anywhere, including while they are walking, sitting, standing, lying down, and even talking. 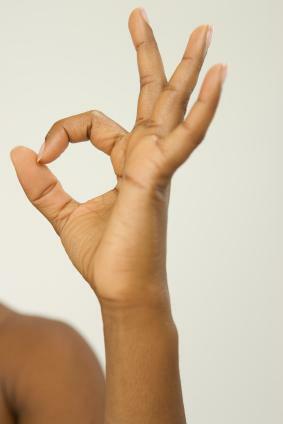 Most people practice mudra with both hands at once, although it can be done one at a time. People may receive benefits from this type of yoga even if they hold the hand gestures for only four to five minutes. Those new to mudra usually start by holding the poses ten minutes at a time, working up to 45 minutes continuously for optimum results. The fingers should be relaxed and comfortable, and not held in a tight or stiff position. The best times to practice hand yoga include just before rising in the morning, a few minutes before falling asleep, before and after meals and while walking. Those interested in mudra are encouraged to set aside some practice time each day to practice one or two gestures so that they can easily recognize the effects. These are more than 20 different mudra positions, including the following. Apan Vayu Mudra symbolizes energy. It strengthens the heart, purifies the body, normalizes blood pressure and can help alleviate menstrual discomfort. You should do this with both hands simultaneously. Fold the forefinger to touch the mound of the thumb. Hold the little finger in an erect position. Place tips of middle finger and ring finger together on tip of thumb, all touching each other. Gyan mudra symbolizes mental peace. Some say it enhances concentration, relieves stress, sharpens the memory and improves sleep. Bring the thumb and index finger together gently. Hold all the other fingers in an upright, but not stiff, position. Varuna mudra symbolizes water. It can enhance beauty, remove impurities from the blood and relieve painful menstrual cramps. Place the thumb down on the little finger. Keep the remaining three fingers comfortably straight. This hand gesture, which symbolizes energy and new beginnings, may help cough and colds, aid in weight reduction and help with digestion. Join the palms in front of the chest. Lock the facing fingers together, keeping thumbs upright. Hold the position for three minutes. Shunya mudra symbolizes heaven and the sky. It may relieve earache, vertigo, hearing problems and numbness throughout the body. Place thumb down on the middle finger. Keep all remaining three fingers comfortably straight. 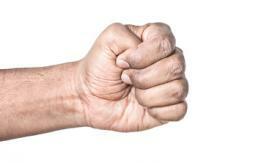 When translated from Indian, Mustika Bandhana means "hand-clenching," and symbolizes the release of aggression. It may be effective in relieving osteoarthritis of the hands and wrist and can strengthen the grip. Bring one arm in front of you at shoulder level, keeping it straight and parallel to the floor. Make a fist thumb side up, inserting the thumb into the other fingers. Open the hand as you inhale, and stretch all five fingers. Fold the hand back into a fist as you exhale, with the thumb tucked in. Repeat about eight times, and do the same with the other hand. After some practice, hand clenching may be done with both hands at the same time. This pose is named for the negative and positive sides of the Venus mounds, which are represented on each hand by the fleshy areas at the base of the thumbs. The planet Venus represents sensuality and sexuality, and this Mudra is said to channel the sexual energy while balancing the glandular system of the body. Place your hands together so palms and fingers touch. Slide your right hand down slightly and interlace your fingers so your right pinky is at the bottom. Rest your right thumb on the fleshy area between the left thumb and forefinger. Men should reverse this so the left pinky is on the bottom and left thumb is between the right thumb and forefinger. 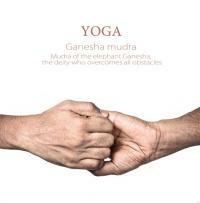 Many people believe that Ganesha Mudra stimulates the heart and improves concentration. It also signifies strength when facing adversity and eases tension. Hold your right hand in front of you with the palm facing your chest. Hold your left hand in front of you with the palm facing the right palm. Point your left thumb down and relax your right thumb. 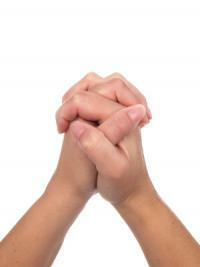 Curl the fingers of both hands around one another and pull slightly out to each side. This hand yoga pose balances all five elements: air, fire, water, earth and metal. Join the left index finger with the right middle finger. Touch the right index finger and the left middle finger. Join the left ring finger with the right pinky finger. Touch the right ring finger with the left pinky finger. 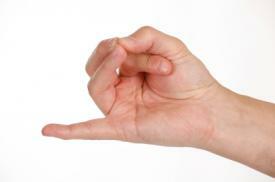 Those who regularly practice hand yoga may enjoy improvement in their overall health. Many believe that mudras restore the body's balance to its natural state. While some gestures provide instant relief, some ailments, such as arthritis and tendonitis, require regular practice.